YORK, SALISBURY, and WARWICK enter. Now, my good Lords of Salisbury and Warwick, Our simple supper ended, give me leave In this close walk to satisfy myself, In craving your opinion of my title, Which is infallible, to England's crown. Now that our simple dinner is over and we're alone in this garden together, my good Lords of Salisbury and Warwick, I'd like to know your opinion of my certain title to England's crown. My lord, I long to hear more about your claim. Sweet York, begin: and if thy claim be good,The Nevils are thy subjects to command. Sweet York, tell us. And if your claim is good, you can command the whole of my family. Then thus: Edward the Third, my lords, had seven sons: The first, Edward the Black Prince, Prince of Wales; The second, William of Hatfield, and the third, Lionel Duke of Clarence: next to whom Was John of Gaunt, the Duke of Lancaster; The fifth was Edmund Langley, Duke of York; The sixth was Thomas of Woodstock, Duke of Gloucester; William of Windsor was the seventh and last. Edward the Black Prince died before his father And left behind him Richard, his only son, Who after Edward the Third's death reign'd as king; Till Henry Bolingbroke, Duke of Lancaster, The eldest son and heir of John of Gaunt, Crown'd by the name of Henry the Fourth, Seized on the realm, deposed the rightful king, Sent his poor queen to France, from whence she came, And him to Pomfret; where, as all you know, Harmless Richard was murder'd traitorously. It goes like this: Edward the Third, my lords, had seven sons. The first, Edward the Black Prince, Prince of Wales; the second was William of Hatfield, and the third was Lionel Duke of Clarence; next to whom was John of Gaunt, the Duke of Lancaster. The fifth was Edmund Langley, Duke of York; the sixth was Thomas of Woodstock, Duke of Gloucester; William of Windsor was the seventh and last. Edward the Black Prince died before his father and left Richard the Second, his only son, behind him. Richard ruled as king after Edward the Third's death, until Henry Bolingbroke, Duke of Lancaster, the eldest son and heir of John of Gaunt, crowned by the name of Henry the Fourth, took over the country and deposed the rightful king. He sent his poor queen to France, from where she came, and sent Richard to Pomfret, where, as you all know, the harmless Richard was murdered treacherously. Father, the duke hath told the truth:Thus got the house of Lancaster the crown. Father, the duke told the truth. That's how the house of Lancaster got the crown. Which now they hold by force and not by right;For Richard, the first son's heir, being dead,The issue of the next son should have reign'd. Which now they hold by force and not by their right. Since Richard, the first son's heir, is dead, the child of the next son should have ruled. The third son, Duke of Clarence, from whose line I claimed the crown, had issue, Philippe, a daughter, Who married Edmund Mortimer, Earl of March: Edmund had issue, Roger Earl of March; Roger had issue, Edmund, Anne and Eleanor. The third son, Duke of Clarence, from whose line I have a claim of the crown, had a child, Philippe, a daughter, who married Edmund Mortimer, Earl of March. Edmund had a child, Roger Earl of March. Roger had children: Edmund, Anne and Eleanor. This Edmund, in the reign of Bolingbroke, As I have read, laid claim unto the crown; And, but for Owen Glendower, had been king, Who kept him in captivity till he died. But to the rest. This Edmund made his case for the crown during the reign of Bolingbroke, as I have read, and if it weren't for Owen Glendower, he would have been king. Glendower kept him in captivity until he died. But let's talk about the rest. His eldest sister, Anne, My mother, being heir unto the crown Married Richard Earl of Cambridge; who was son To Edmund Langley, Edward the Third's fifth son. 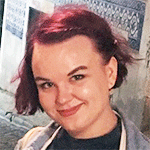 By her I claim the kingdom: she was heir To Roger Earl of March, who was the son Of Edmund Mortimer, who married Philippe, Sole daughter unto Lionel Duke of Clarence: So, if the issue of the elder son Succeed before the younger, I am king. His oldest sister, Anne—my mother—is an heir to the crown and she married Richard Earl of Cambridge, who was son to Edmund Langley, Edward the Third's fifth son. I claim the kingdom by her right. She was heir to Roger Earl of March, who was the son of Edmund Mortimer, who married Philippe, the only daughter of Lionel Duke of Clarence. So, if the child of the elder son succeeds before the younger, I am king. What plain proceeding is more plain than this? Henry doth claim the crown from John of Gaunt, The fourth son; York claims it from the third. Till Lionel's issue fails, his should not reign: It fails not yet, but flourishes in thee And in thy sons, fair slips of such a stock. Then, father Salisbury, kneel we together; And in this private plot be we the first That shall salute our rightful sovereign With honour of his birthright to the crown. What plain line of descent is simpler than this? Henry claims the crown from John of Gaunt, the fourth son. York claims it from the third son. Until Lionel's child dies, he should not rule. The line isn't dead, but lives in you and in your sons, fair cuttings of such a tree. Then, father Salisbury, let's kneel together. And on this secret ground, let us be the first to acknowledge our rightful king with the title he deserves by his birthright. Long live our ruler, Richard, England's king! We thank you, lords. But I am not your king Till I be crown'd and that my sword be stain'd With heart-blood of the house of Lancaster; And that's not suddenly to be perform'd, But with advice and silent secrecy. Do you as I do in these dangerous days: Wink at the Duke of Suffolk's insolence, At Beaufort's pride, at Somerset's ambition, At Buckingham and all the crew of them, Till they have snared the shepherd of the flock, That virtuous prince, the good Duke Humphrey: 'Tis that they seek, and they in seeking that Shall find their deaths, if York can prophesy. We thank you, lords. But I am not your king until I am crowned and my sword is stained with the blood of the house of Lancaster. And that won't happen all of a sudden, but after much plotting and secrecy. Ignore the Duke of Suffolk's arrogance, like I have done, and Beaufort's pride, Somerset's ambition, Buckingham and all of them, until they have caught the shepherd of the group—that virtuous nobleman, the good Duke Humphrey. That's what they're trying to do. And in doing that, they'll destroy themselves, if York can tell the future. My lord, let's end this talk. We know what you mean. My heart assures me that the Earl of WarwickShall one day make the Duke of York a king. My heart tells me that the Earl of Warwick will one day make the Duke of York a king. And, Nevil, this I do assure myself:Richard shall live to make the Earl of WarwickThe greatest man in England but the king. And, I assure myself of this, Warwick: that Richard will live to make the Earl of Warwick the greatest man in England apart from the king. Romancikova, Nina. "Henry VI, Part 2 Translation." LitCharts. LitCharts LLC, 19 May 2017. Web. 22 Apr 2019. Romancikova, Nina. "Henry VI, Part 2 Translation." LitCharts LLC, May 19, 2017. 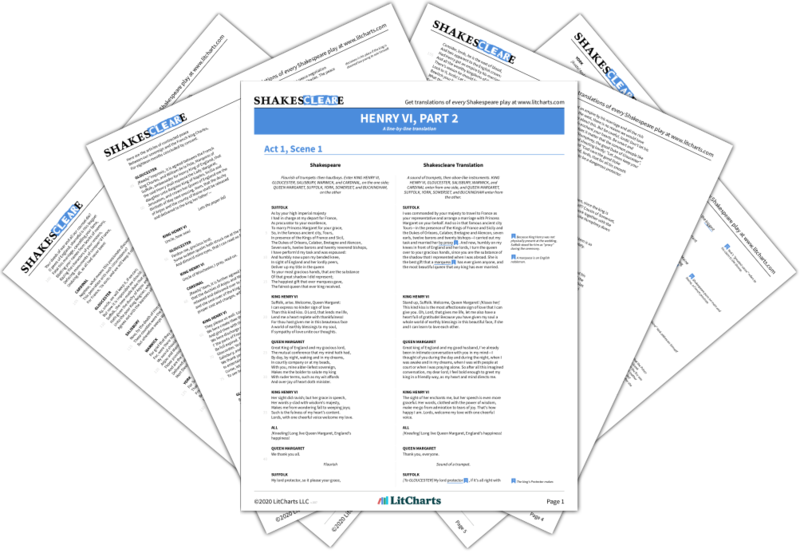 Retrieved April 22, 2019. https://www.litcharts.com/shakescleare/shakespeare-translations/henry-vi-part-2.